Constructing a wind turbine is a complex procedure, with many safety standards and levels of certification that must be met. Before a product can be released onto the market, it must go through numerous stages of testing and development. This article explains the processes a new piece of machinery must go through and why this is important. When designing a new product, there are many things to consider. Indeed, with approximately 8,000 component parts in a modern wind turbine, construction and development is a complex process. Moreover, key components must adhere to strict safety standards. Without thorough research and certification of the relevant technology, manufacturers cannot receive validation for their designs. But with the correct knowledge, expertise, and access to adequate test facilities, it is possible to accelerate the certification process and decrease the time to market for new technologies. What are important things to consider during the design process of a product? Testing and researching in realistic conditions are of vital importance – especially when it comes to compliance with international design standards, such as IEC 61400. Fortunately, in today’s industry, the technology and methods for putting machinery through its paces are better than they have ever been. Facilities such as the Wind Technology Testing Center in Massachusetts, USA, have all the equipment needed to validate wind technologies and boost reliability and performance. Combining analytical tools with physical data provides the most accurate results. Software also plays a significant role in testing. Through modelling and simulation, components can be tested in a virtual environment, giving precise information to developers. The finite element method, a numerical analysis technique for problem solving in engineering, can be deployed to calculate many crucial operational factors, including bearing preload, fatigue life, and bearing contact stresses. Combining analytical tools with physical data provides the most accurate results. This means that ideas and concepts can be extensively researched and components, such as bearings, can be tested according to the conditions they will be exposed to – a necessity for ensuring success. In addition to enabling compliance, validation, and increased reliability, there are other factors that need to be considered. For example, the Scaled Wind Farm Technology facility at Texas Tech University’s National Wind Institute Research Center examines how wind turbines interact with one another in a wind plant. The aim is to improve turbine output by researching how the wake from one turbine affects other turbines downstream. Such research could play a vital role in improving the efficiency of wind farms in the future. 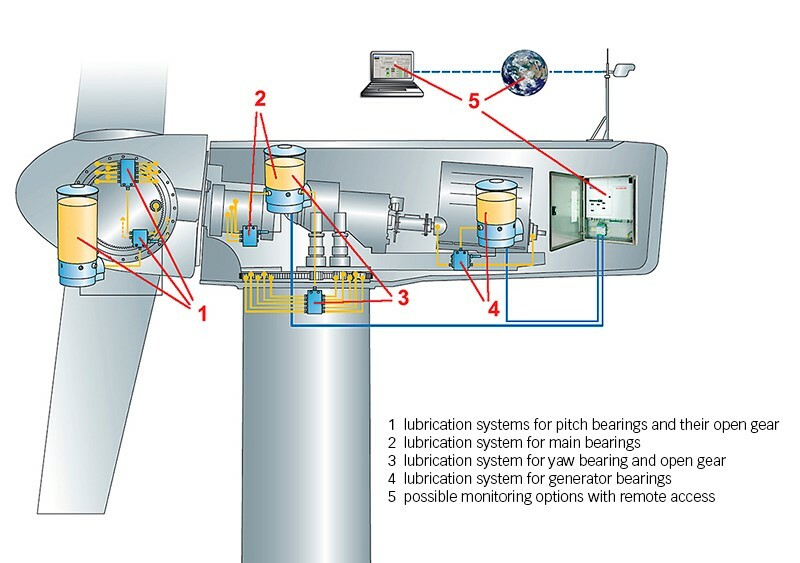 Lubrication applications in a wind turbine. There are many test centers throughout the world that offer comprehensive services for the development of new components. SKF is building a new facility in Schweinfurt, Germany, which is due to be completed in 2017. It is set to be the world’s most powerful large bearing test center – there to support operators in the renewable energy sector and other industries. With extensive research and development, combined with advanced testing facilities, the sky’s the limit for the future of wind energy.